Kieran McCann and Kevin Claxton set upon planning a way to raise some funds for PACT. 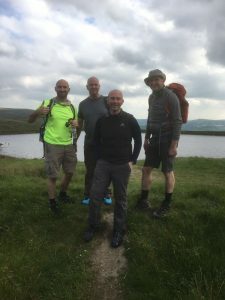 With both being keen walkers they decided on walking the Southern half of The Pennine Way and The Yorkshire 3 Peaks (Y3P) over 4 days, totalling 112miles. They work as part of the Planned Works team at PFP and soon managed to talk the rest of the team into getting involved. Kevin Ray was a key member of the team who gave up his own time and vehicle for 2 days driving them around from point to point (plus doing the Y3P!). The rest of the team Ryan and Matthew Dodworth, Elliott Axe and Alex McKenzie all did the Y3P. Ian Matkin, Anne Edwards and Paul Monaghan offered logistical support in the 6 months it took to plan the event. 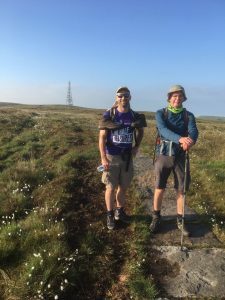 Day one of the walk was 33miles ( in very hot conditions) with Kevin Claxton, Kieran McCann and Desmond Sexton completing. James Pink had to withdraw due to a knee injury though acted as support with Kevin Ray. Day two was a tough 27miles again in hot conditions and by the end everyone’s feet were starting to blister badly. 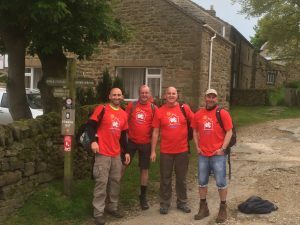 They stayed at The Fountain Inn in Barnoldswick where they got looked after by Lynn and her wonderful team. They sorted ice buckets for the blistered feet and wouldn’t accept payment for their meal instead offering it towards the charity collection. Day 3 was a 20mile difficult stage where everyone really struggled with blisters again athough they made it to their target finish point. The rest of their colleagues joined them on day 4 and did brilliantly to walk the Y3P again in very hot conditions. It was a real team effort with some difficult moments but yet created memories for us all who took part which will stay with us forever. The total amount raised for PACT was £2,336.80.